Two Montgomery County Motor Officers were taken to the hospital after a crash involving motorcycles, Montgomery County Police say. 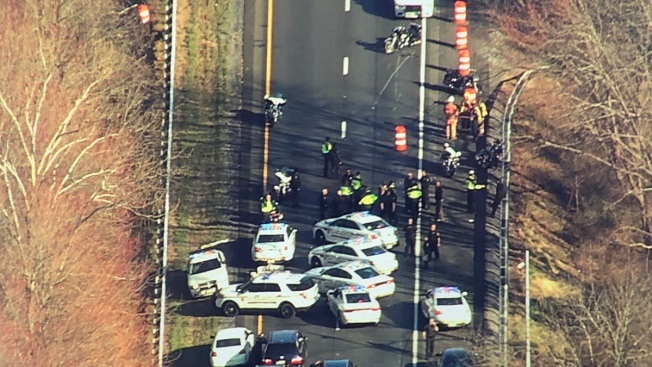 Police motor officers were taken to the hospital after a crash on I-270 involving motorcycles, Montgomery County Police say. Two men were taken to the hospital, Montgomery County Fire spokesperson Pete Piringer says. The police department said multiple officers were hurt in the crash. The officers will have their injuries evaluated at the hospital, police say. Their injuries appear non-life threatening, police told News4. The crash occurred near a weigh station around Exit 22, between Route 121 and Route 109, which is in the area of Clarksburg and Germantown, according to police. Northbound lanes were closed for about three hours during the investigation, but have since reopened.